The gang are embarking on a US tour, which could snowball into a new movie. 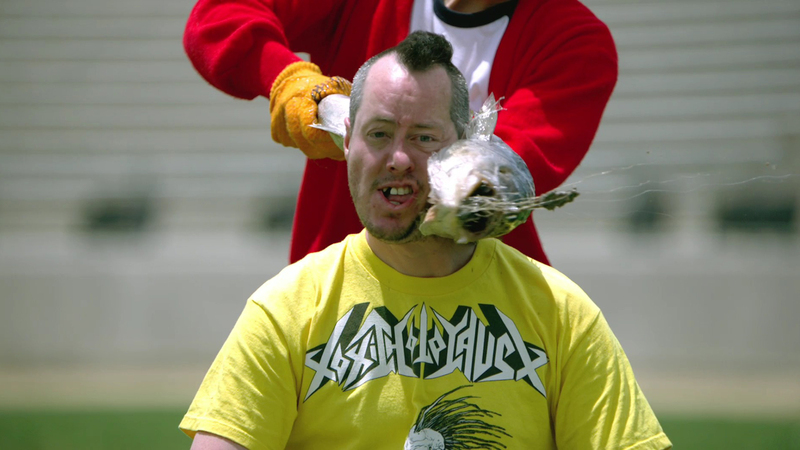 Jackass, the popular MTV prank show that shot the likes of Johnny Knoxville and Steve-O to fame, is making a comeback of sorts. First aired back in 2000, the reality-based stunts featured on the show proved wildly popular with viewers, despite the show only airing for three seasons and a total of 25 episodes. Created by Knoxville alongside filmmakers Spike Jonze and Jeff Tremaine, the programme spawned three films as well as two direct-to-dvd side-quels and several notable spin-offs. Now, some 16 years after the original aired, the gang has reunited for a special US tour featuring all the familiar pranks and humour found in the original show. This is now in Beverly Hills, but this coming month, aka September, these boys will be hitting the road with a few more comedy tour dates in Solana Beach, Santa Cruz, and Petaluma (those are all cities in California). Find dates and ticket info for "Jackass Live, Stunts & Stories, featuring Chris Pontius, Wee Man, Preston Lacy, Dave England & Danger Ehren" on the #jackass Facebook page. Tremaine hinted at news of the tour via Instagram, posting a picture of cast members Chris Pontius, ‘Wee Man’ Jason Acuna, Preston Lacy, Dave Englund and ‘Danger’ Ehre McGhehey together. Since then the official Jackass Facebook page has confirmed the plans, though it would appear several of the show’s principal cast are not taking part. Knoxville, for example, is absent from the roster, despite posing for a picture alongside his Jackass co-stars during a reunion that also featured Steve-O and appeared on the latter’s Instagram feed. Steve-O, real name Stephen Gilchrist Glover, is embarking on his own a comedy tour of the US and Europe this summer, as he looks to develop a new sideline as a stand-up comedian. The other notable absentees, meanwhile, include Bam Margera and the late Ryan Dunn. Close friends from a young age, and co-stars on the popular Jackass spin-off Viva La Bam, Margera has been battling substance addiction since Dunn’s death in a high-speed car crash back in June 2011. Knoxville has previously spoken of the group reuniting for a new film, with a view to it being released in 2019, while Margera has already revealed that the film could be titled ‘Jackass 4: we’re Not Dunn Yet’ in reference to their late friend. The success of this latest tour could therefore determine whether the project moves forward.